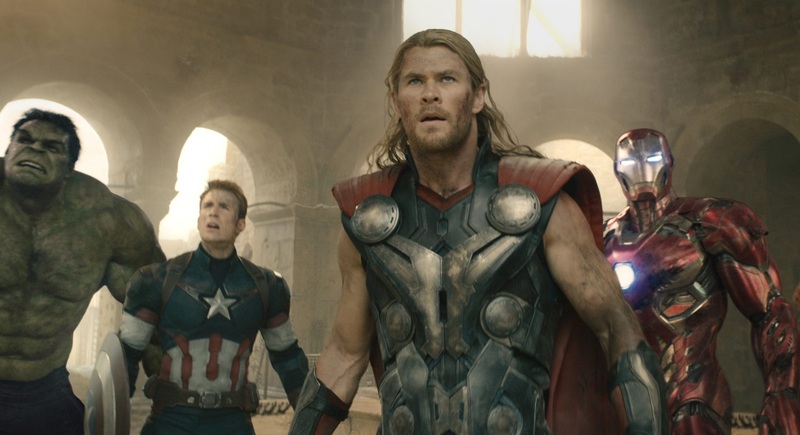 Marvel’s “Avengers: Age Of Ultron” is just one of a litany of comic movies released over the last five years. It’s a bird! It’s a plane! It’s – Ant-Man? It’s been a geek’s paradise with the steady flow of comic book superhero movie blockbusters and TV series, continuing with Thursday’s release of Marvel’s “Ant-Man.” But the intertwining Marvel films can be slightly confusing to the casual viewer. The characters are all part of the Avengers, a superhero team created by Stan Lee for Marvel Comics in 1963 and features the likes of Ant-Man, Iron Man and Thor. In the comics, Ant-Man is not only a founding member of the Avengers, the team was his idea. Yet the Marvel Cinematic Universe started not with Ant-Man, but with “Iron Man” in 2008, possibly because Iron Man is a superhero with a household name and recognizable suit. The story unfolds in the comic books like this: Loki, the God of Mischief, Thor’s half-brother and the villain of “The Avengers” film, provokes the Hulk into destroying a railroad track. A radio transmission is sent to the Fantastic Four requesting help to stop the Hulk. Loki redirects the message to Thor as a trick to overpower him while he’s distracted fighting the Hulk. Unknown to Loki, Iron Man, Ant-Man and the Wasp also receive this message and work together to defeat Loki. When it’s over, Ant-Man casually suggests that they are a great team and should do it again. The Wasp proposes naming the group the Avengers and Earth’s mightiest heroes are born. Hulk leaves soon after, and Captain America is inducted with founding-member status to replace him. So what does this have to do with “Ant-Man” hitting theaters Thursday? It’s important to remember that while the Marvel Cinematic Universe and the comic book universe are two separate entities, the movies wouldn’t exist without the comics. Now back to Ant-Man. His alias is Hank Pym, a scientist who invents a substance that allows him to shrink literally to the size of an ant, but retain his strength. Hank shares this discovery with his girlfriend, Janet Van Dyne, who becomes his crime-fighting partner, the Wasp. The movie picks up after Hank retires as Ant-Man, which is where Scott Lang, the movie’s Ant-Man (played by Paul Rudd), comes in. Also playing a big role in the movie is Hope Van Dyne (Evangeline Lilly), Hank and Janet’s daughter. So how does this all fit into the Marvel Cinematic Universe? Let’s back up a bit. The movies, released in what is called the Marvel Cinematic Universe Phases 1 and 2 (since 2008), are all connected. Yes, that means Chris Pratt’s Starlord character from “Guardians of the Galaxy” (2014) could – and will – meet Iron Man, Thor and the other heroes and villains. Ant-Man also will be tied in to the current storyline of the universe and our occasionally pint-sized hero will meet the Avengers as well. Pym once worked with Howard Stark, the father of Tony Stark (Iron Man). “Ant-Man,” which is the final film of Phase 2 of MCU, will introduce vital characters and explore the history of the Marvel universe between World War II and the present. This film will touch on the origins and development of S.H.I.E.L.D. (the law enforcement/counterterrorist agency) and show the younger years of Pym. It is also the first movie to delve into the idea of the titled superhero with a family, as both of the lead characters have a daughter. By the way, when you go to your next Marvel movie in theaters, don’t walk out wondering why all those people in superhero shirts are sitting through the credits. There’s a reason, and it’s not because they like to watch names scroll across a screen. Stay until the lights come on. The original Ant-Man. Pym, played by Michael Douglas, is the scientist who discovers “Pym Particles,” which allow him to shrink and become Ant-Man. The second persona of Ant-Man, a thief played by Paul Rudd. Hank Pym allows him to break into his home and steal the Ant-Man suit. Daughter of Hank Pym and Janet Van Dyne, played by Evangeline Lilly. The film develops the strained relationship between father and daughter. aka Yellowjacket, the antagonist of “Ant-Man” (played by Corey Stoll). Cross steals the Ant-Man suit to enhance and militarize the technology, making his Yellowjacket suit. Cross is also the CEO of Cross Technological Enterprises, a rival of Stark Industries. The introduction to billionaire, philanthropist and genius inventor Tony Stark (Robert Downey Jr.). Scientist Bruce Banner (Edward Norton) accidentally mutates himself with the ability to become the Hulk. Tony Stark faces the pressures of those who want to militarize the Iron Man technology. The god Thor (Chris Hemsworth) is sent from Asgard to live with humans where he becomes one of Earth’s most powerful defenders. Steve Rogers (Chris Evans) is accepted into an experiment that mutates him into a super soldier. Avengers must protect Earth after Thor’s evil half-brother Loki (Tom Hiddleston) steals a powerful gem. Plagued with night terrors of the world’s demise, Tony Stark prepares to battle again when a new threat emerges. Thor brings Jane (Natalie Portman) to Asgard to protect her – and the Nine Realms – from the threat of the evil weapon Aether. Phil Coulson (Clark Gregg) directs a team of S.H.I.E.L.D. agents as a global law-enforcement agency to protect Earth. Captain America teams up with Black Widow and the Falcon to face their greatest enemy yet. A ragtag group of unlikely heroes – Guardians of the Galaxy – make it their goal to keep a powerful orb out of evil hands. Secret Agent Peggy Carter (Hayley Atwell) works for the Strategic Scientific Reserve to fight atomic threats during WWII. The Avengers assemble again to save the human race from Ultron. A former thief (Paul Rudd) must learn the ropes of becoming Ant-Man to help his mentor, Hank Pym (Michael Douglas).